How did we miss this slide at the launch? A special task force has been formed within the Canadian firm's walls to explore 'strategic alternatives', meaning it could be curtains for the current guise of BlackBerry and its BB10 software. While putting the standard positive spin on things, TCFKARIM (The Company Formerly Known As RIM) confessed in a press release that "the Company's Board of Directors has formed a Special Committee to explore strategic alternatives to enhance value and increase scale in order to accelerate BlackBerry 10 deployment. "These alternatives could include, among others, possible joint ventures, strategic partnerships or alliances, a sale of the Company or other possible transactions." The committee will be formed of CEO Thorsten Heins, as well as Barbara Stymiest, Richard Lynch and Bert Nordberg, with the crack team set to woo potential partners and secure the future of the once-great firm. BlackBerry was obviously talking up its product, highlighting the innovative technology, strong balance sheet (it does have a mountain of cash still, even after the tumultuous time it's been weathering) as well as the imminent cross-platform launch of BBM and the further penetration of BlackBerry Enterprise Server (BES 10). This looks likely to be the last we'll officially hear about the process, with the release stating that "There can be no assurance that this exploration process will result in any transaction. "The Company does not currently intend to disclose further developments with respect to this process, unless and until its Board of Directors approves a specific transaction or otherwise concludes the review of strategic alternatives." 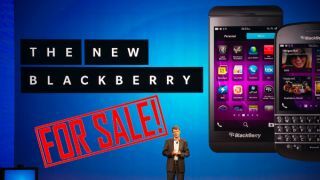 While the early signs for the new software and hardware looked positive, the sales of BB10 devices, as well as the availability, has been limited in 2013. The Z10 and Q10 launched to quiet fanfare, but sadly with high price tags, and the newer Q5 wasn't priced low enough to attract the legions of budget BB users. We predicted the company was struggling to keep things going a year ago when the company kept delaying its much-vaunted BB10 OS, and it looks like the new software wasn't enough to pull out of that slump. The forthcoming BlackBerry Z30 was supposed to address some of these issues, but the smartphone leader board showed no sign of a BlackBerry resurgence. We're still waiting to see the results of the big-money advertising campaign that BB has been rolling out globally. It's important to remember that BlackBerry does hold a number of key patents as well as extensive capability in the manufacture and distribution of smartphones, which could prove to be very enticing for any handset manufacturer looking to take the step up to the big leagues – Lenovo and Huawei have been names mentioned a number of times in recent months. Now the company is officially up for grabs, it will be interesting to see who makes a play for one of the original smartphone makers. It's just a shame that it's come to this. Check out the BlackBerry 10 software in our in-depth review - surely this was good enough to keep the company afloat?